According to his obituary on the Brown’s Funeral Service website, Rogers was a professor who taught at universities, community colleges, and high schools throughout Oklahoma, Kansas, and Wyoming. He specialized in Chemistry, Engineering, Mathematics, and Physics. The obituary makes no mention of Rogers’s numerous political campaigns. Rogers’s politics can best be described as eccentric. During his 2008 presidential run, Rogers reported to the Federal Election Commission that leaf blowers were being used against him to sabotage his campaign. Nevertheless, he also achieved a modicum of success. In 2010, he won the Democratic Party’s nomination for U.S. Senate, falling to incumbent Tom Coburn in the general election. Two years later, he entered the Oklahoma Democratic Party Presidential Primary and placed third, winning several delegates to the National Convention that were never seated. 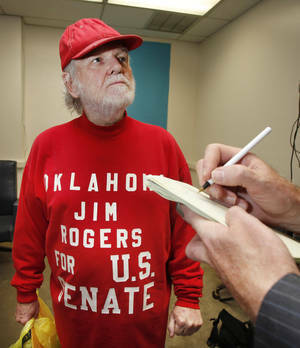 In his final campaign this year, Rogers again ran for Senate as a Democrat, forcing the eventual nominee Constance Johnson into a runoff, which Rogers lost. Rogers’s cause of death is not known at this time. However, according to a November 8 post on the talk page of his Wikipedia article, Rogers recently broke his hip and entered a nursing home. That information has yet to be corroborated. The funeral for Rogers will be held tomorrow in Atoka, Oklahoma. The burial will occur at Atoka’s Green Meadows Cemetery. How did you know Jim?